A Handful of Tickets Added Just Before the Show! 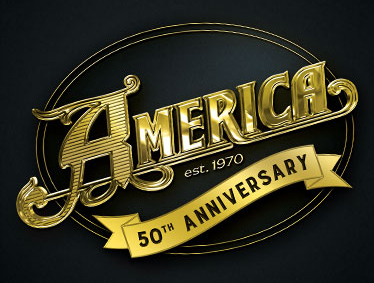 This year marks the 50th Anniversary of perennial classic-rock favorite, America. Founding members, Gerry Beckley and Dewey Bunnell (along with former band mate Dan Peek) met in high school in London in the late 1960s and quickly harmonized their way to the top of the charts on the strength of their signature song "A Horse With No Name." America became a global household name and paved the way with an impressive string of hits following the success of their first #1 single. Forty plus years later, these friends are still making music together, touring the world and thrilling audiences with their timeless sound. America's journey has found them exploring a wide variety of musical terrain. Their best-known tunes, which also include "I Need You," "Ventura Highway," "Don't Cross The River," "Tin Man," "Lonely People," and "Sister Golden Hair" were cornerstones of 1970's Top 40 and FM rock radio. Yet beyond their impressive catalog of hits, listeners would discover there was always much more to America than surface perceptions. The combination of Gerry Beckley's melodic pop rock and Dewey Bunnell's use of folk-jazz elements, slinky Latin-leaning rhythms and impressionistic lyric imagery contrasted well with Dan Peek's more traditional country-rock leanings and highly personal lyrics. Enjoying massive success early in their career, America earned their stripes as musical soldiers on the battlefield amidst the excess, craziness and chaos of the 70's. The trio won the Grammy for Best New Artist in 1972 and began working with George Martin and Geoff Emerick in 1974. This successful team went on to record seven albums and several Top Ten hits, including "Tin Man," "Sister Golden Hair" and "Lonely People." By the mid-70s, inter-band conflicts combined with an exhaustive touring and recording schedule exacted its toll on the group. With Peek's departure from the fold in 1977, Gerry Beckley & Dewey Bunnell rose to the challenge and carried on as a duo. Shifts in sound and direction, changes in producers and managers, and a renewed dedication to the craft of songwriting helped rocket America to the upper reaches of the pop charts in 1982 with their smash single, "You Can Do Magic." During this tumultuous time in their career, Beckley and Bunnell immersed themselves in their craft, infusing a newfound maturity into their rich body of work. Their growth as singers, songwriters and musicians has continued into the present day as illustrated by landmark releases such as 2000's Highway 3-disc box set, 2002's Holiday Harmony, an album comprised of seasonal classics and live showcases, 2007's Here & Now, 2009's Live In Concert: Wildwood Springs, 2011's Back Pages, and 2015's Lost And Found and America: Archives Vol. 1. From their formative years, America has been a band capable of transcending borders with its uplifting music and positive message. Embracing a rainbow of divergent cultures, America's audiences continue to grow, comprising a loyal legion of first, second and third generation fans, all bearing testament to the group's enduring appeal. "I think that the ingredients of the America sound are the basic fundamentals that translate internationally," explains Beckley. "The Italians are huge fans of dance music, but they also love a ballad--they're romantic at heart. It's the same in the Far East. A lot of times in these countries, we see people singing along, and they don't really know what the words mean. Music is truly the international language."